One of the habits I am trying to embrace this year is to keep a sketchbook with me at all times, and to sketch wherever I may be. This is all well and good, but sometimes it gets really cold. Other times people start talking to me. I like people talking, I really do, but not when I'm sketching. 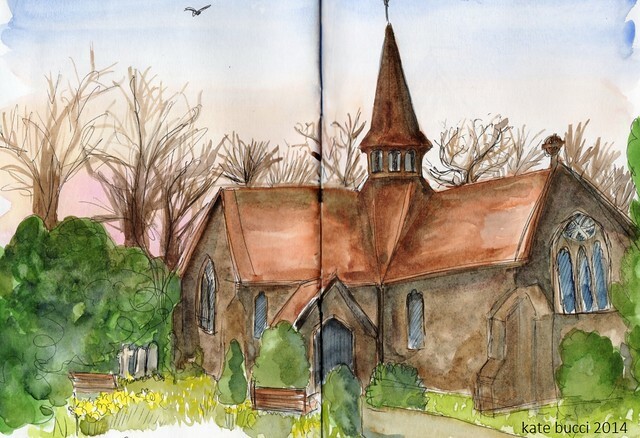 I've also noticed that I have a habit of drawing churches. It's not from any particular religious sentiment, mostly it's just that they are interesting buildings. It does occasionally involve freezing in a churchyard though. I am way behind posting my sketches on here, partly due to laziness because I can't be bothered to scan them, and partly because I do like to have one or two 'in hand' just in case anything happens and I can't sketch for weeks on end. No-one said this had to make sense, right? In any case, it's probably safe to post these which I did in early March. We had an afternoon of terrific fog, a thick blanket that covered everything. Fog isn't particularly fun to sketch but it did make for some interesting skies, like this sunset behind the church. This sketchbook is the lightweight one I keep in my bag - it's not designed for watercolour but it takes it really well, and because it's a cheapo sketchbook I don't feel bad about drawing loose and fast and with lots of interesting lines. When I use my 'good' sketchbook I find myself trying to make my sketches much neater and more precise. 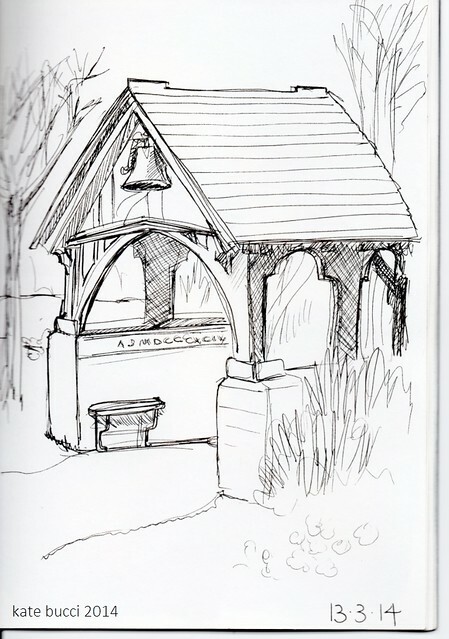 The lychgate. Done in about five minutes just as I was leaving. Isn't traditional English architecture wonderful? I love the slightly wonky roofs and pointed Gothic arches. Once upon a time I wanted to be an architect, but you can't build that sense of history. I'll settle for sketching instead.